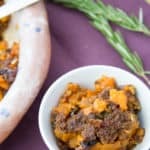 Sweet Potatoes with Gingersnap Cranberry Crumble is a crowd-pleasing recipe that takes a simple side dish to the next level. I managed the production of the largest sweet potato casserole on record during the California Sweet Potato Festival for the Food Network. It weighed in at a half ton, and I had to have a 10-foot long vessel custom made to hold it. Food Network wanted to add something a little more exciting than marshmallows, so we created two additional recipes for the project. This one was everyone’s favorite – I’ve reduced it to a more manageable size, but I’ll be happy to share the version that serves 2000 people if you need it. Of course, you’ll want to use gluten-free gingersnap cookies for the topping. If you’re making the dish dairy-free, be sure the cookies are dairy-free too. My favorite are the ones from Pamela’s, but any crunchy GF gingersnap will do. 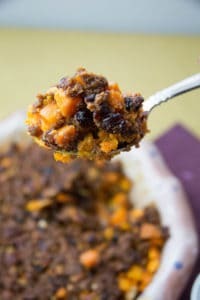 If Sweet Potatoes with Gingersnap Cranberry Crumble don’t sound quite your style – or if you want another version on the table, try these Butter Pecan Sweet Potatoes too! I get my olive oil from the amazing family from Rosenthal Olive Ranch. If you’d like to score some of my favorite olive oil from some of my favorite people, go here. Prepare a 2 or 3 quart casserole dish with pan spray. In a large bowl, toss the cubed sweet potatoes with the olive oil, salt, honey and chili powder, and place them evenly in the casserole dish. Place the potatoes in the oven and roast for 30 minutes. When the potatoes are done, remove them carefully from the oven and stir in the rosemary and pecans. Crumble the topping mixture evenly over the potatoes and return to the oven for 45 minutes. Enjoy! This entry was posted in Dairy Free, Recipes, Side Dishes and tagged autism diet, dairy free, dinner, food network, g-free diet, G-Free Foodie, gluten free, gluten free cooking, gluten free holiday, gluten free holidays, kc cornwell, Thanksgiving. Bookmark the permalink.